Finding the right location for a restaurant in Hong Kong is probably more difficult than finding that special someone to spend the rest of your life with. For a restaurant to be successful the space needs to be attractive, affordable, accessible... and that’s just the very basic requirements. Every now and then, though, some deserving soul manages to hit the jackpot, like long-time Hong Kong resident chef Patrick Goubier, who’s just scored an awesome spot on Star Street for his latest project Chez Patrick Deli. 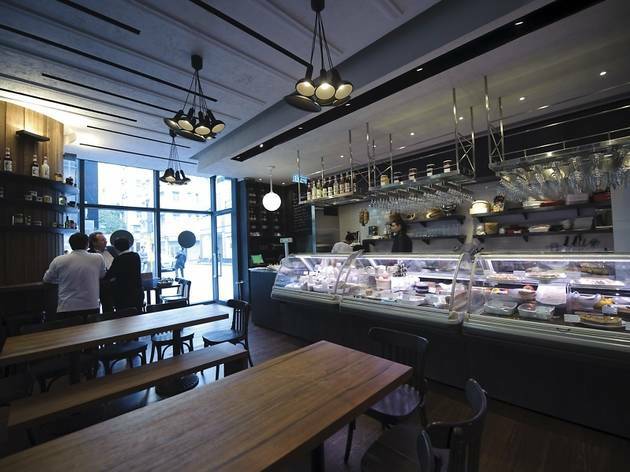 Located just a stone’s throw from Pacific Place Three, the venue is the stuff most restaurateurs dream of. The dining room is blessed with sweeping high ceilings and full-length windows that wrap around the restaurant’s façade. The deli also boasts an alfresco area at the back, furnished with a handful of tables. Inside, chunky tables and colonial-style side chairs occupy the centre of the room, surrounded by tall shelves of fine wines and a row of refrigerated glass cases displaying pots of caviar, homemade terrines and pâtés. 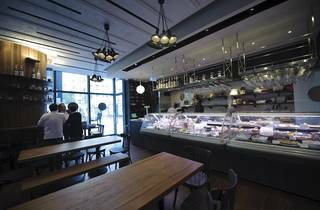 Aside from the selection of ready-prepped café fare, the deli also offers two prixe fixe menus ($300 for two courses; $380 for three courses) which include an appetizer from the deli counter and a main course from the à la carte or blackboard menu. Starters are a nod to simple, country cooking. The terrine de campagne – a thick slice of compacted forcemeat served with balsamic-drizzle greens – is unfussily prepared, allowing the delicate flavours of lean pork to shine through. Homemade salmon rillette is prepared from a mash-up of smoked and fresh salmon, chopped parsley and a dash of lemon juice, creating a coral pink mixture that lends itself deliciously as a condiment piled onto slices of crusty, toasted baguette. Another solid choice is the salmon and scallop tartar, which is perfumed with fresh dill before being dolloped with a spoonful of caviar for a small touch of luxury. For mains, the kitchen slings out a concise compilation of traditional French dishes. Confit duck leg is delicately poached until the gamey meat streaks off the bone in well-browned, succulent strands. The grilled beef fillet is just as impressive. A thick medallion of meat sits centre-plate in a pool of rich brie sauce, propped up by a wedge of potato gratin. Everything on the menu, down to the final slice of moist, blueberry-studded chocolate cake is the sort of rustic, hearty cuisine we imagine Goubier grew up eating and loving. Chez Patrick Deli’s back-to-basics comfort cuisine and bright, bistro-tinged atmosphere is a stark contrast to Goubier’s fine-dining establishment Chez Patrick; but the differences are only surface-deep. At the heart of it, Chez Patrick Deli delivers the same quality dining experience that made Goubier a well-respected name in our city’s restaurant scene. 3 Star St, Wan Chai, 2527 1408. Mon-Sat 11am-11pm. Meal for two: around $750. Lunch set menus from $115.